Brazilian dishes are diverse due to their mixed heritage and different regions. Brazil has mountains, swampy wetlands, highlands, tropical rain forests and who could forget, the Amazon River. The climate also plays a large role in Brazilian cuisine. With the equator running through, there is a tropical climate with humid summers and mild winters. Due to the rainfall, most crops are grown in the south where rice, sugar, coffee, bananas, papayas, avocados and oranges thrive. Brazil is the world’s biggest producer of coffee. Farmers also raise beef, chicken and pigs in the south. The northern region benefits from an abundance of fish in the Amazon but is unable to grow many crops. All along the eastern coast, plenty of seafood is eaten, including lobster, shrimp and fish. Brazilian food recipes use staples including wheat, rice, corn, cassava manioc flour, beans, sugarcane, cocoa, peanuts and Brazil nuts. Vegetable widely used are yams, kale, sweet potatoes, squash and peppers. Besides the tropical fruits, citrus fruits are popular. Meats used are beef, chicken, pork and hunted jungle animals. Sun-dried meat is an important source of protein. Dried cod and dried shrimp come from Portuguese influences and many other fish and seafood are readily used in cooking. Manioc, the flour made from the cassava root, is used in many ways. Toasted manioc is an essential table condiment. Mixed with palm oil, the bright yellow meal produced is served in a bowl and spooned over meat, poultry, or vegetables. Manioc is also used as a thickener for stews or in cakes. 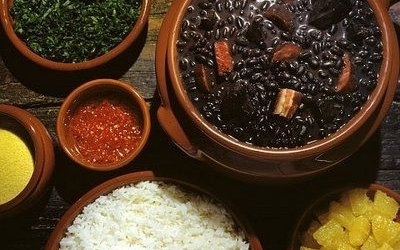 Brazil’s national dish is feijoada, a bean stew dish with assorted preserved meats. Jerked beef, smoked sausage, smoked tongue, salt pork, spices, herbs, and vegetables are slowly cooked with the beans. After cooking the national dish, finish off the meal with a delicious dessert. Try the Brazilian dessert recipe Pão de Mel, a rich honey bread with chocolate glaze.